Kadhai cooking is a purely Indian way of cooking curries where a mix of spices is first stir fried into an iron skillet and then shallow fried veggies are added to the masala mixture. Everything is then cooked for a while and, finished with a lot of butter, cream and dried kasoori methi. This special finishing gives the dish a unique aroma reminiscent of restaurant food. 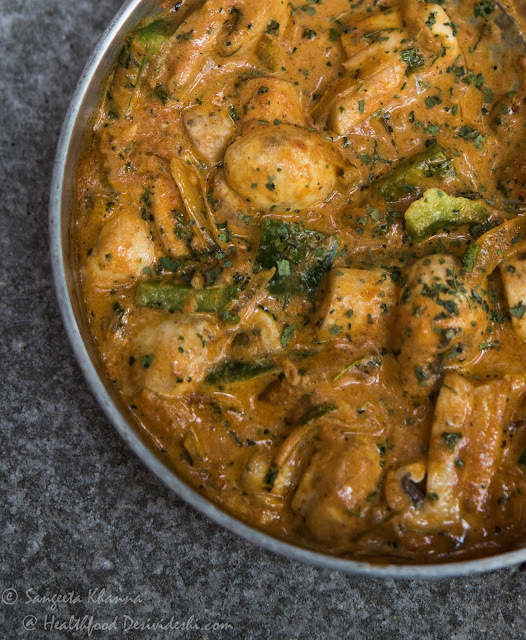 This kadhai mushroom recipe has all that aromatic goodness, just the extra cream and fat has been cut down from this curry, the taste is still great. The restaurants make it unnecessarily rich and oily, this low fat version of home made kadhai mushroom takes just about 20 minutes to make if you are serving 3-4 people. The kadhai cooked vegetables were always cooked in much simpler way in homes but now that everyone wants to replicate the taste of the restaurant food, we sometimes feel a bit under pressure when serving to house guests. It is a complement when someone says the food tastes exactly like the xyz restaurant although it makes me feel a bit sad. We should be respecting our simpler home cooking better as the taste of each curry is so unique it should not be compared to the restaurant food normally loaded with cream, butter and spices. But then it is a great change sometimes to cook restaurant like food at home, sans all the fat. The same procedure and spices are used to make the kadhai paneer and kadhai murgh etc too, the cooking time may vary according to the time taken by the ingredients being cooked. Like chicken will take longer to cook but paneer and mushrooms can be made quickly just like this recipe. But if you use boneless chicken cut into thin strips it takes lesser time. Heat 1 tsp oil in a kadhai, throw in the crushed coriander seeds and cumin seeds and let them splutter. Add the chopped onions, lower the heat and add the salt. Stir fry till onions are light brown, add the ginger and garlic paste and the powder spices, mix properly and cook covered, stirring occasionally on low heat. This is to fry the masala in less oil and to keep the aromas intact. You can add more oil if you wish and make the process a bit faster. 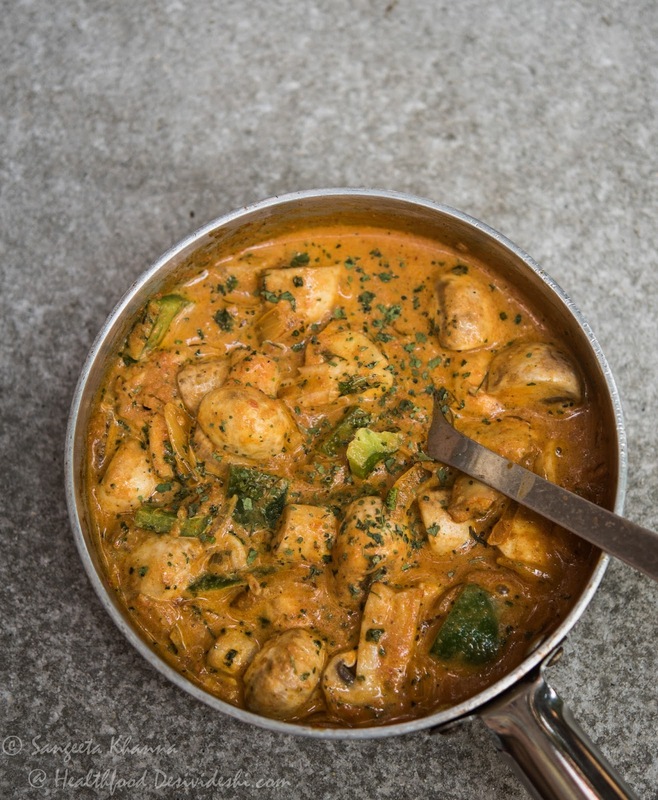 Water can be sprinkled in between stirring to prevent burning that may happen when you use less oil in such curries. Add the tomato puree as soon as the masala mix gets aromatic and let it simmer and cook for 4-5 minutes. 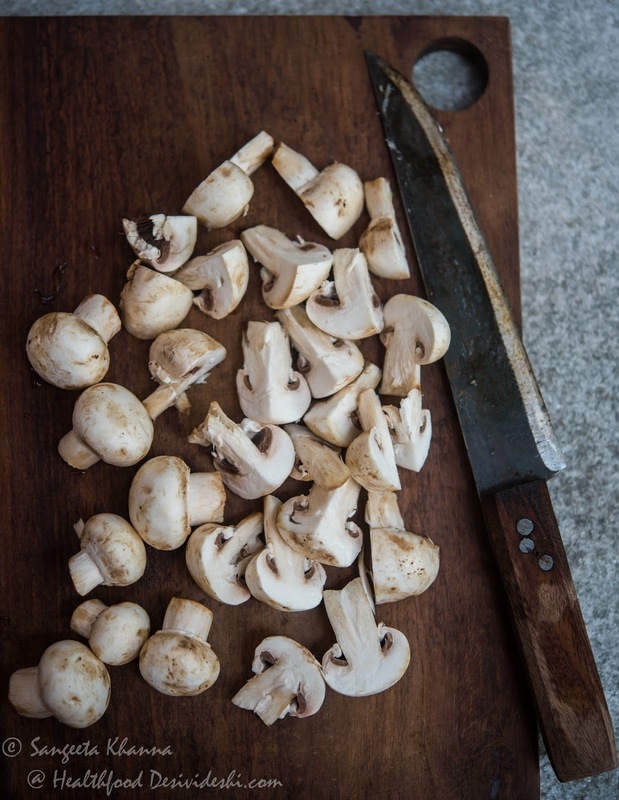 Now add the mushrooms and capsicum, mix well and cook covered for 2-3 minutes. Stir well and add the kassori methi and cream. Add a little milk to adjust consistency if required. Mix well and take the kadhai off heat. Keep the kadhai covered for a few minutes to get the kassori methi flavor seep into the whole dish. Serve hot with naan or thin hot chapatis. Kadhai mushroom or kadhai paneer are the most popular curries that the vegetarians want to serve to guests if they are not serving butter paneer or matar paneer. I mean green vegetables are not considered special somehow and paneer and mushrooms come to the rescue but I am not complaining. Kadhai mushroom has been a favourite for many many years since we started making this back home following a Tarla Dalal recipe. In the last decades we have adapted this kadhai mushroom to our taste. Try it and let me know if you like. I love mushrooms in any dish.My son loves it stir fried in a little oil and then sprinkled with a little salt and pepper. i am a bi fan of mushrooms...no doubt i would like this.. Thanks for the add on foodbuzz! This recipe sounds really good - I love mushrooms and the masala sound great. awee..Nandita the distance is killing. Else we would be inviting ourselves to each other's kitchens. Love.